School trips to Nuremberg are ideal for those studying History and Politics. The city of Nuremberg was an extremely important location from 1933, each year 500,000 National Socialists from all over Germany converged upon Nuremberg for a week. The Zeppelin airfield, which still exists today, was built especially for Nazi parades. In stark contrast, by the end of the Second World War, Nuremberg was utterly devastated by allied bombings. 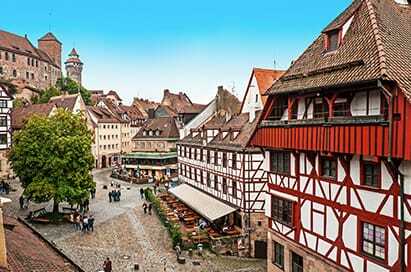 On our school trips to Nuremberg you'll be able to experience the history and redevelopment of this important city. Exhibits include a painting and printing workshop from Durer's time, where various artistic techniques are demonstrated. The museum's collection comprises over 1.2 million objects, making in Germany's largest museum of cultural history. The 100m curved glass facade permits interesting views of the museum's interior and particularly at night, provides an extraordinary backdrop to events on Klarissenplatz.